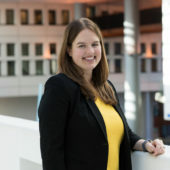 FunctionSonja Swanson, Assistant Professor, Department of Epidemiology, Erasmus Medical Center, The Netherlands and Adjunct Assistant Professor, Department of Epidemiology, Harvard University, USA. When randomized trials are not feasible, observational studies carefully analyzed with appropriate causal inference methods are our best bet for informing personal, clinical, and societal decisions. Because of limitations with conventional analyses, recent years have seen a huge up-tick in “Mendelian randomization” analyses that leverage genetic variants as proposed natural experiments. While the attraction of Mendelian randomization is unquestionable, there remains confusion in both the applied and methodological literature on valid implementation and appropriate interpretation of these studies’ results. The goal of much of my recent research is to improve the transparant use and reporting of these methods, as well as improve the methods themselves. While these contributions to the academic literature are of course valuable, there is another gap to address: training. My proposal is to develop an accessible, transdisciplinary, and rigorous textbook for Mendelian randomization and related methods. Swanson SA, Hernán MA, How to report instrumental variable analyses (suggestions welcome). Epidemiology. 2013;24(3):370-4. Swanson SA. Can we see the forest for the IVs? Mendelian randomization studies with multiple genetic variants. Epidemiology. 2017;28(1):43-6.